Forensic geologists Cassie Oldfield and Walter Shaws plunge into the dark history of the California gold country, into the dark past of two brothers, into a poisonous feud that threatens lives and the land. Death Valley earns its name when a terrorist threatens to unleash lethal radioactive toxins. 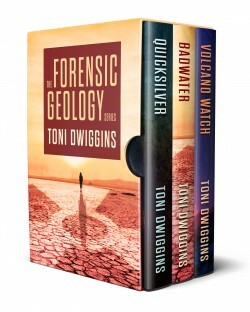 The only ones who can find and stop him are the forensic geologists, and they are up against more than pure human malice. The unstable atom–in the hands of an unstable man–is governed by Murphy’s Law. Whatever can go wrong, will go wrong. The volcano beneath the geologists’ home town is seething, and the mayor is found murdered with a note saying NO WAY OUT. The fate of the town now rests in the hands of an emergency planner with his own twisted agenda. As the volcano moves toward red alert, the geologists race to prevent ‘no way out’ from becoming a prophecy.